The ongoing battle in Connecticut about laws governing the sale of alcohol has been distilled most recently into a dispute over the state’s minimum bottle pricing rule. Total Wine & More, the superstore chain with a growing presence in Connecticut, has challenged Connecticut’s pricing law in court, calling it price-fixing that harms consumers and violates U.S. anti-trust laws. The principles of fair competition under debate hover in the background of a case in which Cramer & Anderson Partner Daniel Casagrande successfully defended the City of Danbury’s Zoning Commission in a court challenge to the validity of a City zoning regulation requiring a minimum of 2,000 feet between liquor sales in the City. In addition to obtaining a state permit, liquor stores need a special permit from the Zoning Commission to open in Danbury, and the Commission granted a special permit for a new liquor store on Mill Plain Road. The owners of an existing liquor store on Mill Plain Road sued, claiming the Zoning Commission had improperly construed the 2,000 feet separation requirement, and that the proposed store would be less than the required distance from the existing store. In a decision dated October 27, 2016, Danbury Superior Court upheld the Zoning Commission’s decision. The ruling determined that the regulation at issue explicitly requires the measurement of distance be taken from the pedestrian entrance to the proposed store to the nearest pedestrian entrance of the existing store, as measured along the public road from one entrance to the other. The Court rejected the claim by the owners of the existing liquor store that the regulation required a straight-line, or “as the crow flies” measurement. Cramer & Anderson Partner Daniel Casagrande. While not receiving as much attention as the minimum pricing law, the issue of separation distances has come under scrutiny in the state. Connecticut does not set separation distances but leaves the issue to the discretion of municipalities. Towns in other states have defended distance requirements on the grounds that “certain uses if clustered together could conceivably generate adverse effects simply because of their concentration,” University of Connecticut law use law professor Terry Tondro wrote (Connecticut Land Use Regulation, 2ed. (1992), pp. 79-80). Since courts generally defer to local legislative bodies on policy issues, they have not closely examined the reasons justifying distance requirements, he added. When not about potential adverse effects and keeping liquor stores safely away from churches, schools and other family services facilities, separation distance laws have served to maintain the clichéd “level playing field” when it comes to competition. However, some towns have been chipping away at separation distances. Last year, Greenwich tossed out a 1,000-foot separation distance between restaurants serving alcohol—and a year earlier it ditched the requirement for the same separation distance between liquor stores. 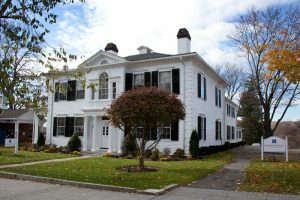 Attorney Casagrande has served as Assistant Corporation Counsel for the City of Danbury from 1990 through the present. He is part of a team of Cramer & Anderson attorneys who specialize in Planning & Zoning Land Use Law. To reach Attorney Casagrande, call the Danbury office at (203) 744-1234, or email him at dcasagrande@crameranderson.com. The firm also has offices in New Milford, Litchfield, Kent and Washington Depot. To learn more, see the website at crameranderson.com or call the New Milford office at (203) 355-2631.